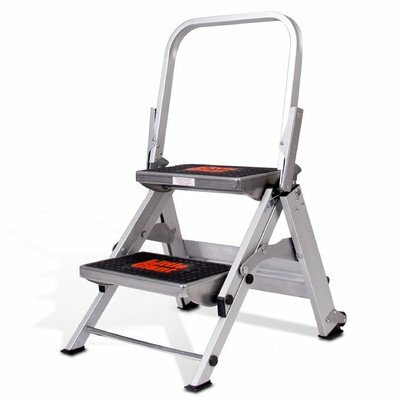 10210BA Features: -Finish any household job in comfort and stability with the Safety Steps wide, slip-resistant step's and rugged aircraft-grade aluminum construction. -Capacity: 300 lbs. -2-Step. Product Type: -Step stool. Color: -Silver; Black. Number of Steps: -2. Folding: -Yes. Lightweight: -Yes. Rust Resistant: -Yes. Slip-Resistant Feet: -Yes. Slip-Resistant Steps: -Yes. Telescoping: -Yes. Duty Rating: -Type IA (Extra Heavy Duty) 300 lbs. Dimensions: -Save space and time: Fold the easy-to-use safety step with one hand and store in only 5.5" of space. Overall Height - Top to Bottom: -2.58 Feet. Overall Product Weight: -15.5 lbs. If you have any questions about this product by Little Giant Ladder Systems, contact us by completing and submitting the form below. If you are looking for a specif part number, please include it with your message.